George Perle was almost as well known as a music theorist as a composer. One of his books was called “Twelve-Tone Tonality,” and the title captures the unique way in which his music was impeccably balanced between serialism and the heritage of tonality. The three string quartets on this wonderful recording show that language in various stages of its development, its expressive intensity always plain. Perle wrote his Second Quartet to prove to himself that he could write a string quartet in D minor. It’s a tonal work awash in chromaticism, the music ambiguous yet evocative. The Fifth Quartet (1960) was the harbinger of “a certain stage of maturity,” he later said. Like Alban Berg, a composer he venerated, Perle writes in a language governed by an arrangement of 12 notes, yet the results sound richly lyrical rather than bitingly acerbic, the frequent cliché of serial music. The final movement, a kaleidoscope of rapidly changing ideas, still sounds forward-looking today. That nervous intensity carries over into the Eighth Quartet, “Windows of Order,” written for the Juilliard String Quartet and premiered in 1988. It’s a single-movement work in which fragmentary motifs coalesce into a contrapuntal dialogue, then drift apart again. Development and unraveling seem to work in a continuous cycle. The CD ends with the earliest work on it, a slow movement that Perle later dismissed as derivative, yet which fascinates for its air of austere melancholy. 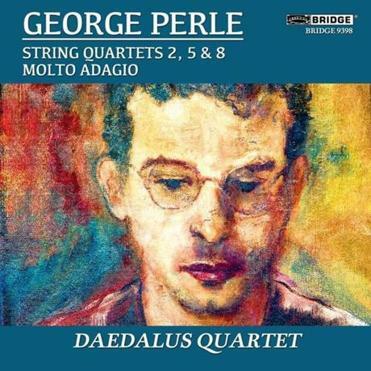 The superb young Daedalus Quartet shows a perfect grasp of Perle’s style and makes a powerful and convincing case for him as a composer of critical importance.